Ghats (riverbanks) are places of worship for the Hindu people. This is because the river is a rich source of nourishment for human settlements, and consequently the ghat the nurturer of the greatest civilisations. Despite growing urbanisation in the subcontinent, it is very common for people to make pilgrimages to ghats, each of which is of considerable Vedic significance. 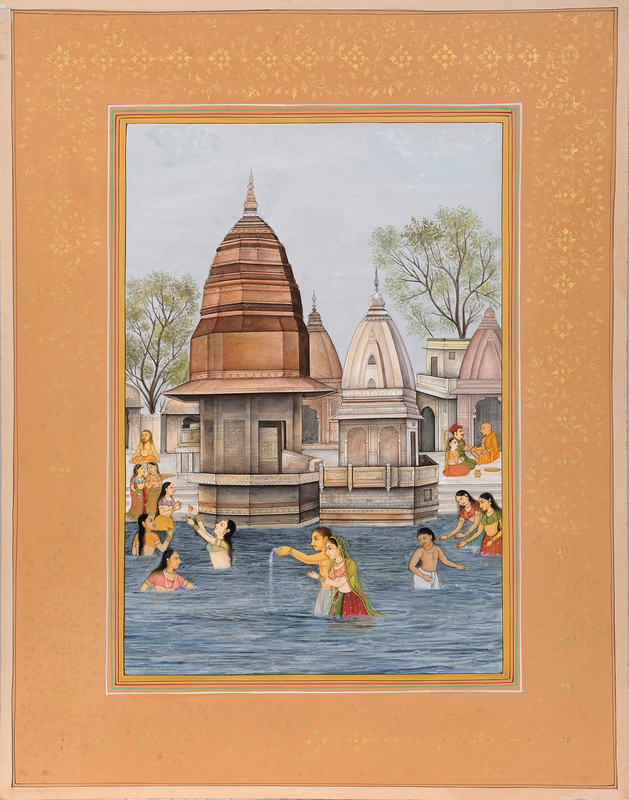 The one depicted in this paper watercolour is Har Ki Pauri, which in the local Khari boli means 'the steps leading up to the lord'. It is said that Shiva and Vishnu had been at the Brahmakund in this ghat during Satyayuga together (the Brahmakund is where drops of the otherworldly nectar has touched the earth). No wonder this ghat is counted among the most popular pilgrimage destination in North India, and is a subject of choice with artists. Artist Navneet Parikh has depicted with perfection the life and spiritual current flowing through this ghat in Haridwar. A pale twilight sky, characteristic of the plains as you go northwards into the mountains, sets off the masterful stone templetops with great beauty. Do not miss how consummate is each curve of the sculpted edges, how lifelike the light of the setting sun reflecting off the smooth stone surfaces. The two trees on either side in the background, their slim winding trunks ending in shocks of deftly stippled leaves, add balance to the composition. It is the stream in the foreground that is the most challenging part of the painting. 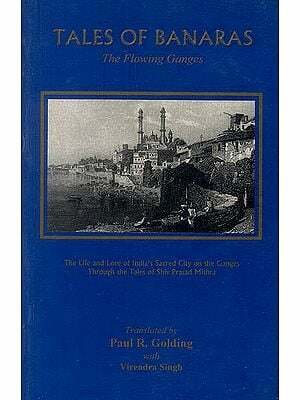 Complex brushstrokes in shades and tints of blue have gone into a highly realistic portrayal of the sacred Ganga waters. The couple in the foreground is making an offering to their ancestors, while the damsels nearer to the steps - their black tresses loosened - are busier having a good time than proverbially washing off their sins. A couple of maidens are simply taking a walk along the ghat, deeply absorbed in conversation. While a wealthier couple sits in consultation with the Brahman to the right of the viewer, a yogi is performing padmasana in the other end of the frame. Note how flawless is each and every detail of the figures - their limbs in motion, their garments in line with traditional Northern fashion, and the shringar of the ladies.